The rural crime novel Rumrunners by Eric Beetner knows exactly what it is and exactly what it isn’t. As long as the reader maintains this same knowledge of the book’s identity, it’s a highly entertaining read. However, stray into the illusion this book is literary in any serious way, or subversively transgressive (as indie crime fiction can try to be), and you will be disappointed. Let it be what it is and nothing more and you’ll have a fun ride. Rumrunners tells the story of the McGraw men, drivers for the Stanley crime family in Iowa. 87-year-old Calvin McGraw drove for the Stanley’s for decades, hauling drugs, money, bodies, and anything else that needed moved, before being forced into retirement and allowing his son, Webb, to take over. Webb’s son, Tucker, turned his back on the family business and became an insurance agent instead, with the hope of likewise keeping his now-teenage son, Milo, out of a life of crime. When Webb, now in his sixties, goes missing on a job, along with the valuable load he was hauling, the Stanley’s show up at Tucker’s house telling him the debt for the missing load now falls on him. He has to either come up with a lot of money or find his dad. Tucker McGraw is a thirty-something divorced dad whose insurance business barely covers his ex-wife’s exorbitant alimony demands. He eats frozen pizza most nights, and he has never once been in a fight, run from the cops, or been involved in anything illegal. All of that changes when he calls his grandpa, Calvin, and they embark on a wild quest to find the middle McGraw before it’s too late. Tucker receives his baptism into the backwoods world of crime and punishment. He’s timid for a while, convinced he can stay clean and avoid really becoming a criminal in the process of finding his dad, but he soon discovers the world he’s entered doesn’t follow the rules he’s used to, and escaping criminals is going to require becoming one. Beetner’s dialogue and prose is snappishly funny, and he reaps a lot of humor from the contrast of personalities between grizzled old-timer Calvin and his soft, khaki-wearing grandson, Tucker. Throw in a bunch of rural thieves and tough guys of various levels of intelligence and competence, and you have a fast-paced crime novel that manages to balance suspense with hilarity. And this book definitely is suspenseful, containing tense, improvised fights and several well-described high speed chases. 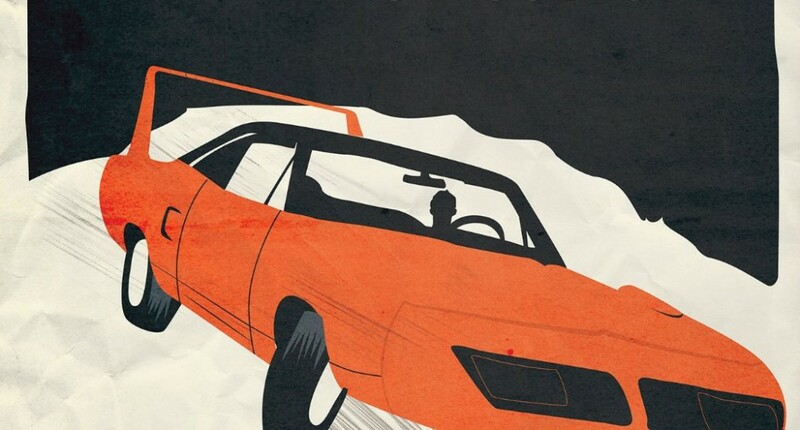 The cover features an illustration of the bright orange 1970 Plymouth Superbird featured in the book, and Rumrunners does definitely love its automobiles and gives them plenty of attention, but a few curious automotive mistakes in the book provide speedbumps for any motorheads reading. In a paragraph in which Beetner discusses the ridiculous (or awesome, depending on your taste) rear wing on the Superbird, he errantly states the car was manufactured by General Motors rather than the Chrysler Corporation. In another spot, after having previously stated the car has an automatic transmission, he describes a driver downshifting the car before pulling into a driveway. These are minor errors, but they did make me scratch my head while reading. Overall, Rumrunners is a ton of fun. It’s rural noir that eschews the bleak, deathly serious tropes conventional to that genre and instead finds its heartbeat in hardboiled humor. It’s a fast read about fast cars, slow thugs, and an average bloke who suddenly has to learn how to navigate both. Check this one out. David Nilsen is a librarian, writer, and book critic from Ohio. He is a member of the National Book Critics Circle and the editor of the literary journal Fourth & Sycamore. His writing has been published or is forthcoming on The Collagist, Rain Taxi, Punchnel's, Bright Wall / Dark Room, and others.